I’m loving all of the printable coupons that Welch’s has been releasing lately! 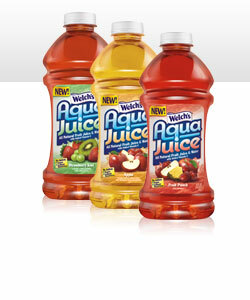 Right now you can print 2 – B1G1 Free coupons for Welch’s AquaJuice here or in the Coupons.com widget in my left sidebar. And if you haven’t already, you can print 2 – B1G1 Free coupons on the Welch’s site here as well! I recently had the opportunity to review this juice and thought it tasted great! This juice retails for around $3.99 at my local Kroger when not on sale. I printed these coupons off last month and lucked out when they went on sale for $2.49 each at Kroger last week. I scored 10 bottles for $1.00 each! I plan on printing these out and holding on to them to see if I can score another deal in the next few weeks. I’ll keep you posted if I see anything! For more coupons, check out my most recent Coupon Round Up here.